In Manggarai on the afternoon of Mother’s Day, 22 December, on a quiet street in a public hall there is a lot of noise. It is rowdy with the noise of marginalized children preparing for a bazaar and performances for their end of year celebration. Mother’s Day goes largely unnoticed in Indonesia. There is no equivalent day for fathers. The children of Manggarai are aware of it has been their learning theme for December — mother. They have drawn pictures, created pieces of glittery artwork, written stories and poems during the month which are on display for the patrons of the afternoon to view. During the year the children from two venues in Manggarai have accumulated points for attendance, diligence and effort in the classes they attend with Sahabat Anak. Friday night classes are for English lessons only and are held in a multipurpose room the other side of the train station. Sunday and Monday classes have a range of subjects for the children. All the children have points to spend. The points are represented by stars. There are over 30 dedicated volunteers, young professionals, helping out the children and the young families of this community. Some of the volunteers are the same age as the parents of these children. A visual representation of life path differences. The children get to cash in their points for items at the bazaar. A backpack is worth 13 stars. There is much excitement as the children go in class groups to select their rewards. The volunteer teachers start the performance session of the afternoon’s activities with a dance. The kids are riveted watching their teachers. This display gives them confidence to get up in front of an audience to perform when it is their turn. There are nine performances to follow. The Friday night classes that focus on English put on two of those performances. The first is from the class of smaller children singing ‘You are my sunshine’ and the larger children recite a poem called Mother and sing a song also. There is a mask wearing dance performance from the Orange Class, and the Banana Class is a set of 13 girls dressed as pink dancing mice. A choir of little cherubs sings also. After all of the children’s performance the teachers head back to the dance floor singing a song especially for the children and hand out flowers. Some children hadn’t spent all their star points so more shopping had to be finalized before the event was finished. One of the children in the audience was an older boy, maybe 14 or 15. He is a boy that has been through this system going to the same weekend classes as the children that now attend. A couple of years ago, he was sponsored to attend Sahabat Anak’s non-formal school in Pegangsaan. He wasn’t attending school as he was needed to help out with a growing family. He had been out of the school system for five years. From the non-formal school he made his way back to the formal schooling system with the assistance of Sahabat Anak. Getting back into the school system is a significant milestone but not the end of the road. He still comes from a marginalized family with younger siblings who now attend the tutorial lessons. He still attends extra curricula activities that he enrolled in with SahabatAnak before getting back into school. So, he is still a part of the Sahabat Anak family, under their care until such time as he secures the job he can get as an adult with the skills he has accumulated or he no longer needs the assistance. He sits and cheers on the children with their recitals and performances. He encourages his younger siblings, you can do that too. His presence is a layer of reassurance and confirmation that things can work out for the best when you have star qualities such as diligence and effort. Suatu siang di Manggarai, pada tanggal 22 Desember lalu, bertepatan dengan Hari Ibu, Karang Taruna Manggarai dipenuhi banyak suara. Adik-adik Sahabat Anak (SA) Manggarai sedang mempersiapkan bazar dan pertunjukan untuk perayaan akhir tahun mereka. Tidak ada peringatan sejenis bagi para ayah, seperti Hari Ibu. Tema belajar adik-adik selama bulan Desember adalah “Ibu”. Mereka menggambar, membuat aneka kerajinan tangan dengan kilau gliter, menulis cerita dan puisi,dan kemudian dipajang untuk para pengunjung sore itu. Selama satu tahun, adik-adik yang belajar di dua lokasi SA Manggarai ini telah mengumpulkan poin untuk kehadiran dalam bimbingan belajar (bimbel), kerajinan, dan kerja keras mereka. Kelas Jumat malam adalah kelas bahasa Inggris, yang diadakan di Karang Taruna Manggarai, dekat stasiun kereta. Kelas Minggu dan Senin diisi berbagai mata pelajaran untuk adik-adik. Semua adik memiliki poin untuk dipakai saat bazar. Poin ini ditandai dalam bentuk bintang. Ada sekitar 30 kakak voluntir, profesional muda yang berdedikasi untuk membantu adik-adik dan keluarga muda di komunitas ini. Beberapa dari voluntir usianya sama dengan orang tua adik-adik binaan, sebuah bentuk nyata perbedaan jalan hidup. Poin kehadiran adik-adik ditukar dengan barang-barang yang dijual di bazar. Sebuah tas ransel harganya 13 bintang. Adik-adik sangat bergembira ketika mereka memilih hadiah. Kakak-kakak voluntir memulai kegiatan sore itu dengan menampilkan tarian. Adik-adik terpaku melihat kakak-kakaknya. Penampilan itu membuat adik-adik merasa lebih percaya diri ketika tiba saatnya mereka tampil. Ada sembilan pertunjukkan yang ditampilkan. Adik-adik kelas Jumat, yang fokus pada pelajaran Bahasa Inggris, menampilkan dua pertunjukkan. Penampilan pertama dari kelas adik-adik yang lebih kecil, mereka bernyanyi “You are my sunshine” dan adik-adik yang lebih besar membacakan puisi ‘Ibu’ dan juga bernyanyi. Ada pertunjukan tari topeng dari Kelas Orange dan Kelas Banana, ada 13 adik perempuan menari dengan kostum tikus berwarna pink. Sebuah paduan suara malaikat kecil juga bernyanyi. Setelah semua pertunjukan ditampilkan, para pengajar kembali ke depan dan menyanyikan sebuah lagu khusus untuk adik-adik dan memberikan mereka bunga. Belum semua anak menghabiskan bintangnya, sehingga “belanja” dilanjutkan sebelum kegiata selesai. Seorang adik laki-laki yang juga ikut menonton acara ini, usianya sekitar 14-15 tahun. Ia adalah seorang adik yang juga mengikuti kegiatan bimbel Manggarai setiap akhir pekan. Beberapa tahun yang lalu, ia mengikuti sekolah non-formal SA, Pusat Kegiatan Anak (PKA) di Pegangsaan. Ia tidak bisa mengikuti sekolah formal karena harus membantu perekonomian keluarga. Ia telah putus sekolah selama lima tahun. Melalui sekolah non-formal SA, ia mampu kembali ke sekolah formal. Hal ini adalah langkah besar yang penting, tetapi bukan akhir dari perjalanannya. Ia berasal dari keluarga marjinal dan adik-adiknya saat ini juga mengikuti kegiatan bimbel SA. Ia masih menghadiri kegiatan ekstrakurikuler SA yang sebelumnya sudah diikuti saat masih bersekolah di sana. Ia masih bagian dari keluarga Sahabat Anak, yang mendapat perhatian sampai dewasa dan mendapat pekerjaan atau ketika ia tidak lagi membutuhkan dukungan khusus. Ia duduk dan ikut bersorak-sorai melihat penampilan adik-adik. Ia juga ikut mendukung adik-adiknya sendiri. Kehadirannya merupakan jaminan kepastian bahwa hasil terbaik diperoleh ketika kita memiliki kualitas bintang untuk tekun dan bekerja keras. 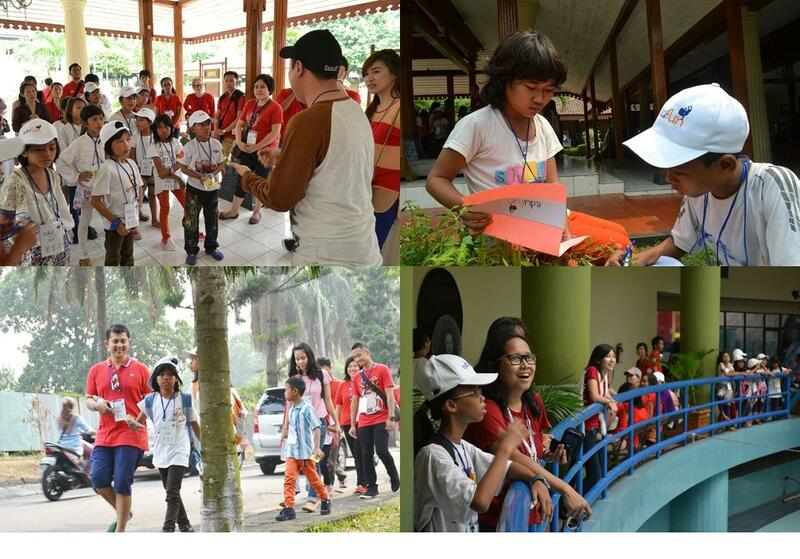 One of the activities programmed by SahabatAnak Manggarai in 2013 was a visit to Taman Mini Indonesia Indah (TMII). This activity is aiming at introducing Indonesia to the children, so they can embrace its cultural richness and diversity. The activity was carried out on October 28, 2013, and was supported by Jakarta Praise Community Church. It was followed by 52 mentored children in SA Manggarai. 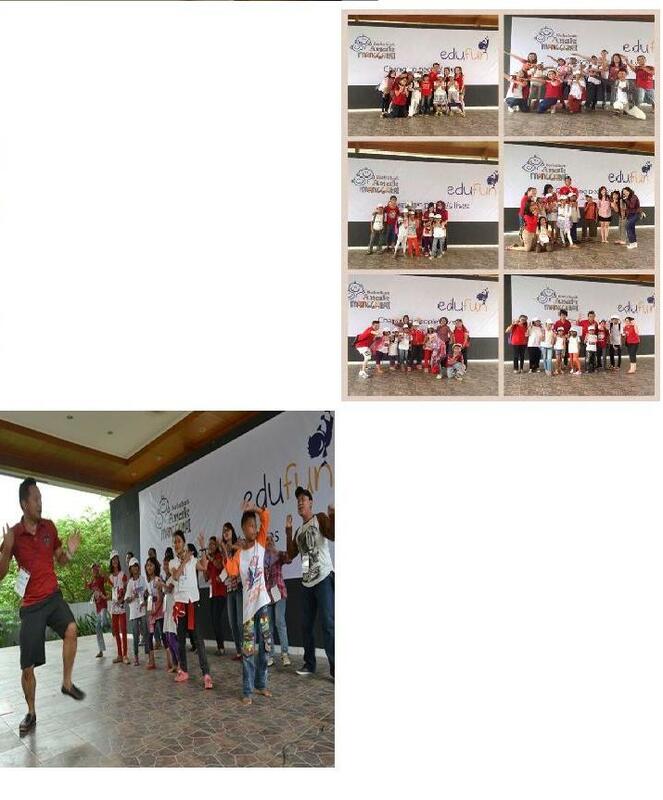 To make the education program exciting, the activity was packaged in Amazing Race concept. 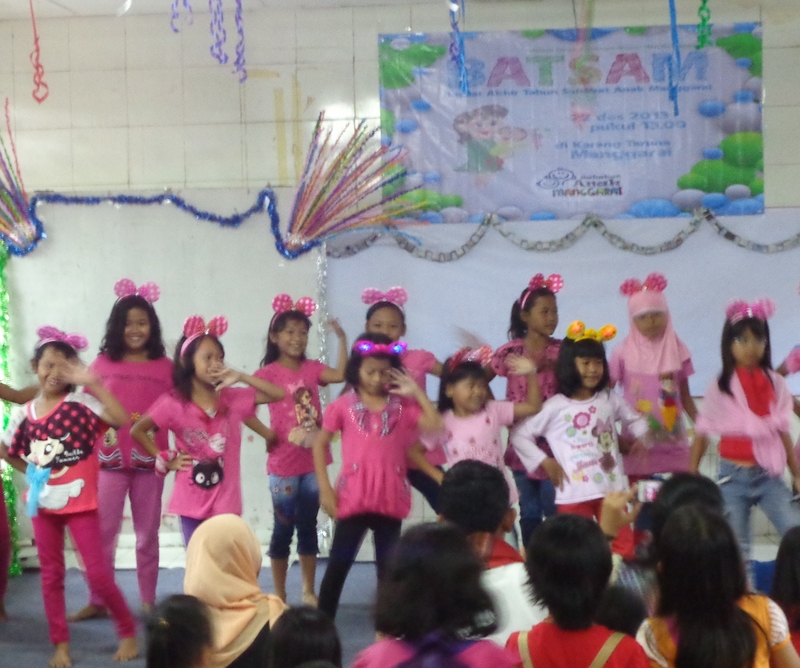 The children were divided into several small groups, and equipped by a map and descriptions of Indonesia’s provinces. The teams had to guess the name of the province that matches the descriptions, then went on searching its location by consulting the map. After completing the first mission, the organizer would give new challenges for the next routes. There were four provinces that must be visited by each team. As soon as they arrived in the set destination, they were introduced to several activities such as Eat Bulaga games, Name Guessing games, and also kite-making. After the Amazing Race is done, the activity was continued by a visit to PP Iptek building located in the TMII. Through the education program, SA Manggarai has proved that learning could be done everywhere, not solely in the classroom. The children were not just happy, but they could also gain so much. For example, they could learn working in a group while they were given a challenge as a team.